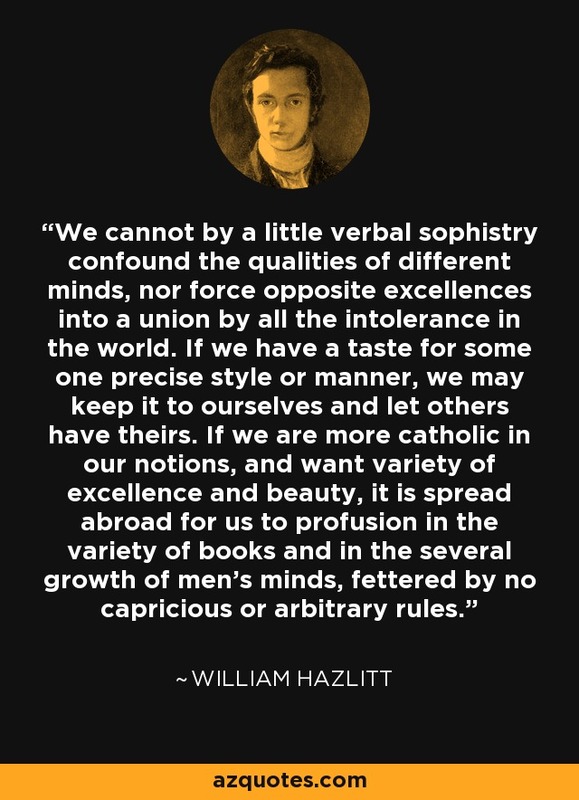 We cannot by a little verbal sophistry confound the qualities of different minds, nor force opposite excellences into a union by all the intolerance in the world. If we have a taste for some one precise style or manner, we may keep it to ourselves and let others have theirs. If we are more catholic in our notions, and want variety of excellence and beauty, it is spread abroad for us to profusion in the variety of books and in the several growth of men's minds, fettered by no capricious or arbitrary rules. "Table Talk: Essays On Men And Manners". Book by William Hazlitt. Chapter: "On Criticism", 1822.